NO PLACE FOR NORMAL: NEW YORK: 191. Patent Medicines, and Who Is a Quack? 191. Patent Medicines, and Who Is a Quack? Such were the patent medicines of the time, which, by the way, were anything but patented. In seventeenth-century England, elixirs that found favor with royalty received letters patent, allowing them to use the royal endorsement in marketing; the name “patent medicine” resulted, and stuck. And what did these medicines cure? Indeed, what didn’t they purport to cure? Swaim’s Panacea, the product of Swaim’s Laboratory in Philadelphia, was created in 1820 by a Professor William Swaim and claimed to heal scrofula, coxalgia (hip-joint disease), mercurial rheumatism, chronic ulcers, scrofulous ophthalmia, eczema, and poisoning of the blood. Still marketed in the 1890s, it was sometimes pictured as a stalwart Hercules clubbing the multimouthed dragon of disease. Ayer’s Cathartic Pills, the creation of Dr. J.C. Ayer of Lowell, Massachusetts, was a “safe, pleasant and reliable family medicine,” sugar-coated and designed to cure flatulency, dizziness, foul stomach, rheumatism, liver disorder, kidney complaints, constipation, and diarrhea. When he retired in 1878, Dr. Ayer – who was in fact a real doctor – was thought to be the wealthiest manufacturer of patent medicines in the country. Cocaine Toothache Drops, manufactured in Albany, promised an instantaneous cure for toothache and were marketed especially for children, while also guaranteeing to put the user in a “better” mood. Hailed as miracle cures, cocaine, morphine, and even heroin were sold quite legally. Slaying the dragon of disease. Hostetter’s Bitters, the creation of Dr. Jacob Hostetter, a prominent Pennsylvania physician, was promoted by his son and first appeared on the market in 1853. Pictured as a mounted hero spearing a writhing dragon of disease, it claimed to cure colds, dyspepsia, indigestion, constipation, biliousness, and general debility. When the Civil War broke out, it was promoted as “a positive protective against the fatal maladies of the Southern swamps,” and the War Department shipped trainloads of it to the troops, who surely appreciated it. In peacetime thousands bought it, convinced that a daily dose would keep them healthy and in good spirits. Good spirits certainly resulted, and we shall soon see why. Dr. Williams’ Pink Pills for Pale People, a Canadian product manufactured in this country in Schenectady, was sold throughout the U.S. and the British Empire. What it offered, besides alliteration, was a cure for St. Vitus’ Dance, locomotor ataxia, partial paralyxia, seistica (whatever that might be), neuralgia rheumatism, nervous headache, the after effects of grippe, palpitation of the heart, pale and sallow complexions, and “all forms of weakness in male and female.” Whether a Dr. Williams actually existed, I haven’t been able to determine. Nor was rural America spared: the names of nostrums appeared on rocks, trees, fences, barns, and sheds; adorned the soaring basalt cliffs of the Palisades, visible to passengers on Hudson River steamboats; and with the completion of the first transcontinental railroad in 1869, graced telegraph poles and even the Rocky Mountains, and the Sierra Nevada range in distant California. And as a traveler approached San Francisco by train, he was informed that “VINEGAR BITTERS IS ALL THE GO FOR LOVE!” “Ob-scenery!” protested the New York Tribune, but to no avail. The ultimate in advertising was achieved when a nostrum maker bought a steamboat, adorned it with ads for his liniment, cast it adrift on Lake Erie, and let it float to destruction over Niagara Falls. In a nutshell: patented medicines were mass-produced products, allegedly medicinal, that were marketed aggressively with false statements and extravagant claims. Many patent medicines were vastly successful, permitting their creators to join the ranks of the newly moneyed, along with profiteers fattened by government contracts during the Civil War, inventors of patented shirtfronts and trusses, Wall Street speculators, railroad magnates, and other rajahs of finance. · For toothache: 3 drops essential oil of cloves on cotton, placed in the hollow of the tooth. · To prevent or cure baldness: 2 oz. eau de cologne, 2 drams tincture of cantharides, 20 drops each of oil of rosemary, oil of nutmeg, and oil of nutmeg, to be rubbed on the bald spot every night. · For burns and scalds: 4 oz. powdered alum put into a pint of cold water, then applied to the affected area. · For freckles: ½ dram muriate of ammonia, 2 drams lavender water, ½ pint distilled water, applied with a sponge 2 or 3 times a day. · For offensive breath: 6 to 10 drops concentrated solution of chloride of soda. · For deafness: 3 drops sheep’s gall, warmed, put into ear at bedtime and syringed with warm soap and water in the morning, applied for 3 successive nights. Armed with such remedies, why would one need patent medicines, too? Because even the best home remedies didn’t always work, and how could one resist the glowing promises, the fervent testimonials, the round, square, drum-shaped, pig- or fish-shaped colored bottles, or even bottles in the likeness of a lighthouse, an Indian maiden, or a bust of Washington? Also, many of the nostrums made you feel so good. and below the skull, “DEATH’S LABORATORY.” It’s no coincidence that one year later, in 1906, Congress passed the Pure Food and Drug Act, the first of a series of federal consumer protection laws that, slowly but surely, brought an end to the patent medicine industry. Morris Fishbein, the longtime editor of the Journal of the American Medical Association, devoted much of his career to exposing quacks and driving them out of business. But among his targets were osteopathy, homeopathy, chiropractic, dietary fads, and physical therapy, which should give one pause for thought. Not that the quacks – or, if you prefer, patent medicine makers – went out of business completely. Instead, they shifted their talents from selling nostrums to promoting deodorants and toothpastes, using the same techniques they had employed so effectively in selling nostrums. Never underestimate the skill and resourcefulness of the American huckster; they’re with us to this day. And so are many products once promoted with extravagant or dubious medicinal claims in the patent medicine era, and now still on the market, albeit with a change in image and ingredients. Soft drinks are prominent among them. · 7 Up, marketed as Bib-Label Lithiated Lemon-Lime Soda when launched in 1929, contained the mood-stabilizing drug lithium citrate and was advertised as a remedy for hangovers. The drug was removed from it in 1948. Now 7 Up is advertised as a soft drink only. · Dr. Pepper, created in Texas in 1880 and marketed nationally in 1904, was advertised as a brain tonic and “liquid sunshine,” capable of building up cells broken down by fatigue. 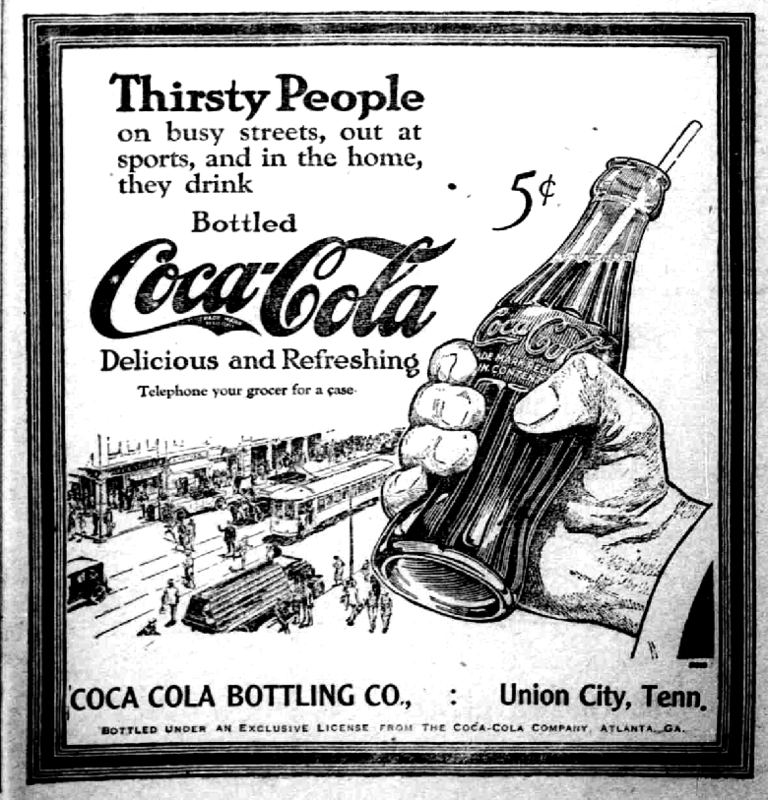 · Pepsi-Cola, created in 1893 in North Carolina and named Pepsi-Cola in 1898, was marketed as a drink that would let you “zoom over your troubles” and scintillate, and nip an incipient headache in the bud. Whether such claims can be labeled “medicinal” can be debated, but they certainly came close. · Hires Root Beer was created by a Philadelphia Pharmacist named Charles Elmer Hires in the 1870s and was marketed as purifying the blood and making rosy cheeks. Coca-Cola deserves a mention of its own. It was invented by Confederate Colonel John Pemberton who, wounded in the Civil War, became addicted to morphine and sought to find a less dangerous opiate to relieve his pain. 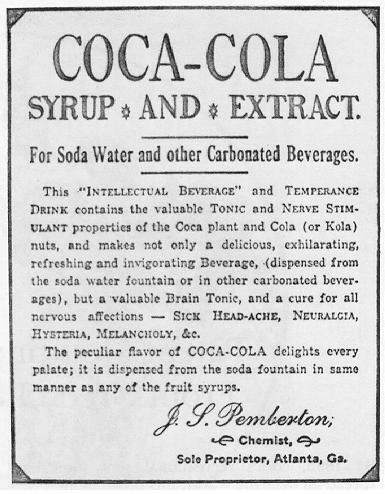 Launched in Atlanta in 1886, Coca-Cola claimed to cure morphine addiction, dyspepsia, neurasthenia, headache, and impotence. The exact formula for Coca-Cola’s natural flavorings has always been a closely held trade secret, but its two key ingredients originally were cocaine (hence “Coca”) and caffeine (from Kola nuts). Cocaine was eliminated in 1903, and in the 1911 lawsuit United States v. Forty Barrels and Twenty Kegs of Coca-Cola the government tried to make the company eliminate caffeine as well. The 40 barrels and 20 kegs won in court but in 1916 lost on appeal, causing the company to settle the case by agreeing to reduce the amount of caffeine. Today the soft drink contains 43 mg of caffeine per 12 fluid ounces. Patent medicine makers came to be considered quacks, but what exactly is a quack? According to my Webster’s Collegiate Dictionary, which is based on Webster’s Third International, a quack is simply “a pretender to medical skill.” The word derives from the archaic Dutch word kwakzalver, or “hawker of salve.” In olden times kwak meant “shouting”; quacksalvers touted their wares in a loud voice in the market. Today “health fraud” and “pseudo-science” are practically synonyms for “quackery,” which is defined as the practices or pretensions of a quack, but the matter is by no means simple. Orthodox medicine has always been suspicious of alternative treatments, and only with great reluctance came to acknowledge a certain validity in acupuncture and chiropractic, and this last only after a prolonged legal battle. Because the American Medical Association had labeled chiropractic “an unscientific cult” and urged physicians not to associate with its practitioners, five chiropractors sued the AMA for violations of the Sherman Antitrust Act. The federal lawsuit Wilt v. American Medical Association ended in 1987 with a judge’s ruling that the AMA had indeed violated a section of the Sherman Antitrust Act and engaged in “a long history of illegal behavior”; while declining to decide whether or not chiropractic had any validity, the judge issued a permanent injunction against the AMA to prevent such behavior in the future. But that was not the end of it. Today quackbusters, often self-appointed, are rampant. Prominent among them is the organization Quackwatch, founded in Pennsylvania in 1969 by Stephen Barrett, a now retired physician, to combat “health-related frauds, myths, fads, fallacies, and misconduct.” Its targets have included acupuncture, Ayurvedic medicine, alternative medicine, herbal medicine, homeopathy, chiropractic, dietary supplements, and organic food – so wide a range of products and services, including traditional practices going back thousands of years, as to provoke serious doubts. Anything alien to modern mainstream medicine seems to merit attack. Despite numerous awards, Quackwatch and its founder are highly controversial and, in my opinion, deserve just as much scrutiny as the practices they attack. My personal take: following my surgery for colon cancer in 1994, I was told that my cancer had a 40% chance of recurring, but that chemotherapy could reduce this to 20%. But the idea of lying there passively at intervals over a period of weeks, while they dripped an alien substance into me, did not appeal, least of all the added possibility of unpleasant side effects. As an alternative, I embraced a nutritional approach and began following an anticancer vegan diet that included cruciferous vegetables, garlic, soy foods, and lots of fruits and vegetables generally, preferably organic. This approach involved no nasty side effects and I am still on it today; the cancer has not returned. So when it comes to a debate regarding the pros and cons of alternative medicine, I have to come down emphatically on the side of pro. Friends of mine with cancer have gone the orthodox way, enduring chemotherapy and radiation and their hideous side effects; not one of them survived. I don’t deny that there are cancer quacks out there, and other quacks as well. But to pin that label to all forms of alternative medicine is unwarranted; some of that stuff works. There are times for mainstream practices, and times for alternatives; both offer benefits, and both have limitations. The consumer/patient has to make informed decisions. But watch out where you get your information; make sure the source is trustworthy, and not simply the self-interested agent of the medical/ industrial complex (yes, it really does exist) or its opponents. As always, caveat emptor applies. Louis Pasteur -- a quack? Meanwhile, let’s be glad that the patent medicines of yore have been buried in the dust of time; there’s little doubt that their promoters – yes, even the original sponsors of that beloved American icon, Coca-Cola – were quacks. On the other hand, it’s worth remembering that Louis Pasteur, the pioneering French microbiologist, and Linus Pauling, twice a Nobel Prize winner, who advocated massive doses of Vitamin C for treating various diseases, including cancer and the common cold, were both denounced as quacks in their lifetime. As was John Harvey Kellogg, a promoter of vegetarianism and, with his brother, the creator of Kellogg’s Corn Flakes, a staple of my childhood as essential to the American scene and psyche as Coke (and I don’t mean cocaine). winner -- and a quack? Coming soon: Where radar, transistors, sound movies, television, and so much else were pioneered right here in the West Village, while scandalous things happened nearby.